Creativity is an essential part of any successful home design, and it is one of the main qualities that sets interior designer Suzi Kaloti apart. She has been channeling creativity all her life, leading her to start Lavish Design Build and fueling its exponential success. Based in the Greater Toronto Area, Suzi has built a name for herself by creating signature designs that focus on efficient and sustainable luxury spaces. Quality, service, communication, and innovation are at the core of her business and what she claims as her keys to success. Through her work, concern for her clients, and unique ideas for each space, she brings homes together in a way that is truly beautiful, elegant, and full of life. 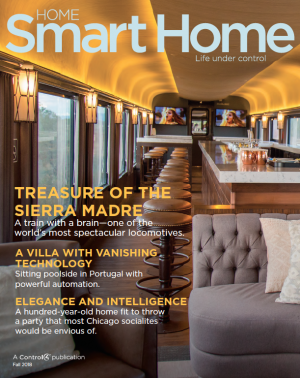 We were able to spend a little time with this award-winning designer, and so we asked her about her passion for every project, why smart home technology is an integral part of her designs, and how her long-term commitment to the spaces she creates sets her business apart. What sets Lavish Design Build apart from the rest? I’ve been lucky to have incredible clients that want the absolute best for their homes. Our clients are always looking for creativity and craftsmanship when it comes to design, and that is what draws them to Lavish Design, I believe. They recognize the talent we bring to the table as a full-service construction, interior design, and staging firm; once they’ve experienced the Lavish difference, they become loyal repeat customers, and many of them become friends for life. That personal relationship with our clients is something that we pride ourselves on and what helps us create such unique spaces to fit each homeowner’s needs perfectly. Why do you use smart home technology in your designs? Home automation is not only about the convenience and comfort of having controls at your fingertips—we also use home automation as an intrinsic part of the design to set the mood and tone of the space. Luxury homeowners and builders alike demand a clean and stylish look for their living spaces, and technology allows us to not only provide that but to also delight customers with different smart home scenes or experiences. I enjoy working with Titan Automation and Control4 because I can rely on them as my smart home professionals to come in and bring a space to life with technology. For example, they are able to set the mood at the end of the day by programming a home so that with just the touch of a button or a simple voice command a homeowner can have perfectly dimmed lighting and soft, relaxing music. By automating things like the lighting system, speakers, blinds, cameras, etc. in a comprehensive smart home system, it allows us to make our homeowners’ busy lives a lot more productive, manageable, and enjoyable. To put it simply: Once you go smart, you can never go back! I love to take on every new project as a blank canvas. Then, by the time we’re done, we have turned that canvas into a beautiful mosaic of ideas and creativity. The end result is a lavish space for my clients to enjoy for many years to come. To see my clients’ facial expressions as they walk through their new area for the first time is incredible and one of my favorite parts of what I do. It really puts everything we do in perspective, and it drives me to always create the best for my clients. What is one of your most important styling points when creating a space? I like to create a unique ‘wow’ feature in every room, no matter if it’s large or small in size. The human eye loves symmetry and proportion—we look for it everywhere. Every Lavish Design room will have a central feature that harmonizes with the rest of the space and embodies the unique functionality and balance for that room. How do you stay confident in such a demanding industry? When you have a passion for what you do and give it your all, confidence comes from the knowledge and the success that comes with each project. I’ve also surrounded myself with a phenomenal team of tradespeople and like-minded industry professionals who can collaborate to make my vision for any space a reality. It is important to know that the design is going to 'wow' when clients walk into the room for the first time, but it is also important for me to know that I am putting quality products and materials in the space that are going to last. No successful designer is an island, and so having other professionals I can rely on for expertise allows me to be confident that I’m getting my clients the very best in every area of the home.